With so many thrilling and inventive marketing activities taking place across the world every day, it can be incredibly difficult to keep up with what exactly is going on! Here is our top pick of the campaigns that you may have missed. With South Africa experiencing some of the highest skin cancer diagnosis rates in the world, Nivea have taken it upon themselves to tackle the problem in another light-hearted, summer family experience. To highlight the importance of applying sunscreen regularly, the brand have designed the “Nivea SunSlide” which aims to combat the difficulties parents face with applying sunscreen to their kids by doing the impossible - making it fun! As children play on the slide, they are coated in a layer of SPF 50+ waterproof sunscreen which is diluted into the water. The NHS Blood Donation campaign uses innovative augmented reality technology which allows members of the public to give some virtual blood via an iPhone. The augmented reality app used in the campaign connects to a large advertising screen, featuring an ill patient and empty blood bag. The visual recognition technology used detects a sticker on the recipient’s skin which then overlays a plaster, needle and tube over their arm. 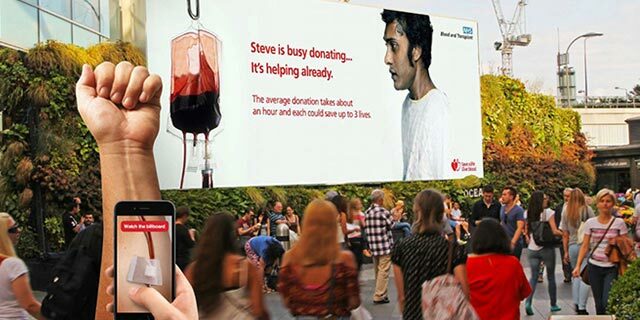 As the virtual donor watches on they see their ‘blood’ flowing down the tube and up onto the large screen in front of them. As more ‘blood’ is drawn, the participant watches as the ill patient returns to health before their eyes, allowing the power of blood donation to be shown, it really is that simple! The campaign features real-life individuals whose lives have been saved by the NHS blood donation services; Natasha (34) who required a transfusion after the birth of her son in December 2015 and Amit (30) and Shalona (28) who both require regular transfusions as a result of inherited life-threatening blood conditions. 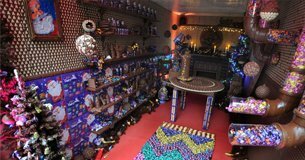 Unsuspecting luxury shoppers in Bangkok recently experienced the true reality of leather goods when they visited a new pop-up store in the city – a shopping experience that turned into something that they will never forget! 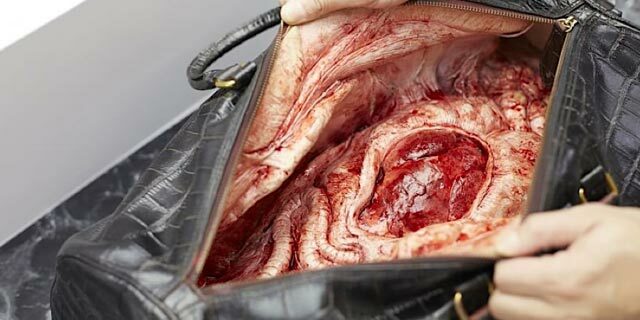 The animal rights activist group attached prosthetic skin and fake organs – including a beating heart – to the insides of wallets, handbags, jackets, belts and other leather goods. They also put fake blood inside gloves and shoes, before allowing unsuspicious shoppers to try them on. The creative director of the campaign said the idea was to make consumers aware that “every leather product caused a sensitive animal to endure a miserable life and suffer a terrifying death”. Whether you agree with this ‘shockvertising’ stunt pulled by PETA or not, it has definitely made a lasting impact with those who have seen it! 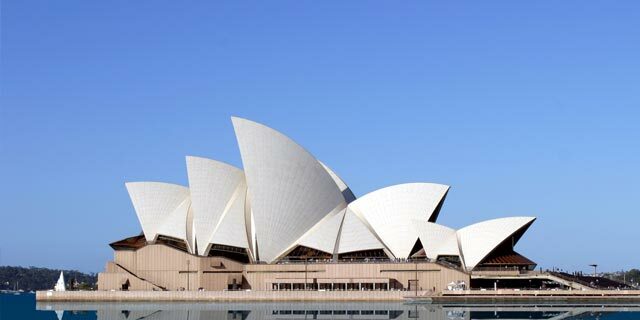 Australia’s most famous building and most Instagrammed location is a cultural and architectural icon that is visited by more than 8.2 million people every year – a fact that Sydney Opera House and Samsung wanted to make the most of! Any visitors to the Opera House who posted a photo of the world-famous building on Instagram were in with a chance of receiving a real-time video invitation to #ComeOnIn for a cultural experience personalised to them. The extraordinary experiences up for grabs included a behind-the-scenes private tour of the concert hall, a sound check with Jose Gonzalez, musician meet-and-greets, Bennelong kitchen tours, acrobatic lessons with the cast of the praised Blanc de Blanc and even a glass of bubbles before a show, very fancy! In addition to social content, the campaign also utilised PR and the use of Samsung ambassadors to drive awareness of the transformative benefits of the arts and culture. 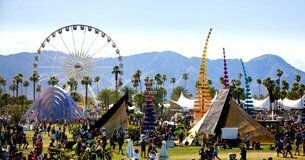 The Queen turns 90, Evian takes consumers virtual surfing and YouTube brings Coachella to the masses. More White. More Light. More Life. 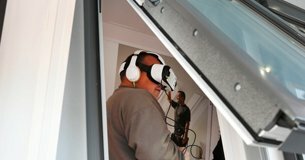 As part of the 250 date “VELUX 2016 Tour” of the UK & Ireland, Kommando & partner agency, Story, are shedding some light on the brands latest and most modern addition to their product portfolio.